On the 30th of October 1905, the decree that leads to the creation of the School of Applied Medicine of the Colonial Health Service states the importance of the means made available for improving the knowledge of students in exotic pathology. "To give Assistant Medical Officers, both physicians and chemists of the colonial troops, instruction specialized, theoretical, practical necessary to fulfil the obligations of the Health Service of Colonial Troops in France and in the colonies". The establishment will therefore be furnished with a library, of the same level as one in a school for higher studies, having close links with the university library of the Medical School of Aix-Marseilles. Since its creation, this library has evolved in relationship with the teaching and research missions of the Pharo School until it has become a centre of documentation for data concerning biochemical specialities and then medico-surgical specialities. It also contributes towards the enhancement of the patrimony of the Colonial Health Service by preserving and exploiting a collection of archives on France's accomplishment in the domain of health in its colonies. Situated on the premises of the School of Applied Medicine until 1944 (the year of bombing and fires on the site during the liberation of Marseilles), the library consists of works and medical reviews which gradually specialize in tropical pathology. - J. Lisfranc : Clinique chirurgicale de l'Hôpital de la Pitié Edition 1845. - A. Laveran : Traité des Maladies et épidémies des Armées Edition 1875. - Berenger Ferraud : Traité des maladies des Européens au Sénégal Edition 1878. - Grall : Précis de pathologie exotique (Indochine) Edition 1900. - Laveran. : Traité du paludisme Edition 1907. - Martin-Leboeuf-Roubaud : La maladie du sommeil au Congo français Edition 1909. - Le Dantec : Précis de pathologie exotique Edition 1929. - Botreau-Roussel : Clinique chirurgicale des pays chauds Edition 1929. - Ch. Joyeux et A. Sice : Précis de Médecine coloniale Edition 1936. - Archives de Médecine Navale 1864 , 1, 1889, 55. - Archives de Médecine Navale et Coloniale 1890, 54, 1896, 66. - Annales d'Hygiène et de Médecine Coloniale 1898, 1, 1914, 17. - Mémoires académiques de Médecine depuis 1928. - Pathologie exotique : depuis 1908, date de création de la société par Laveran. - Presse Médicale depuis 1902. - Regular subscriptions to international scientific reviews on medicine, biology, public health, for either general practitioners or specialists in Tropical Medicine. The updating of many matters concerning exotic pathology and the periodic recapitulations of the state of knowledge and new discoveries induce the Pharo School to transform the library into a centre of documentation. - In 1936 the centre of documentation and study for Chemists of the colonial Health Service is created with subscriptions to two essential journals, Chemical Abstracts and Biological Abstracts, and to reviews on analytical Chemistry. The purpose of the library is to gather in one place all the documents necessary for completing the knowledge of colonial chemists, permitting them to perform analyses and expert appraisals and to do the work and research that is expected of them. In 1937, the centre already possesses 40 000 reference documents. - In 1938, a building extension project is brought to a halt by the war and the German occupation. - In 1941 the project of a medico-surgical centre of documentation is realized. A medico-surgical file contains all the reference documents and publications concerning exotic pathology and military medicine. This medico-surgical centre of documentation also serves as an instrument of training, collaboration and the diffusion of information not only for colonial physicians but also for scientific groups and learned societies of the time as well as for foreign countries. A radiology museum is also established in 1941, this epoch-making time for radiology. The works of all the members of the Colonial Health Service are collected and analysed. The museum gathers collections of X-rays together with their interpretations. After the bombings during the liberation of Marseilles in 1944 and the fire in the building which housed the library and the centre of documentation, these are moved in 1948 to Rue Perrin-Solliers, near the Michel Lévy Military Hospital in Marseilles. The centre is reopened in 1954 in a Pharo which has become the school of applied medicine and the instruction and research centre of the Health Service of Colonial Troops. 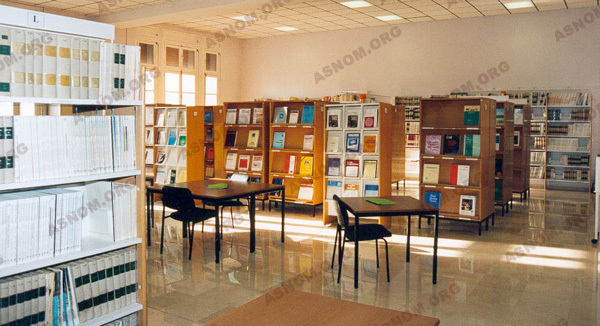 The centre of documentation consisting of its library and an audio-visual service of "Tropical medicine" becomes an instrument of collaboration and the diffusion of scientific information (publication of technical and practical works such as "Les Agrégés du Pharo"). From 1963 onwards, the teaching authorities put into operation a scheme for aiding Health Service assistants to prepare, wherever they happen to be, for competitive exams intended for isolated candidates on overseas duty. This system functions until 1982. This period will be distinguished by the modernisation of instruments of documentary research with the use of data banks, the computerisation of the administration, developments in the exchange of documents, the importance given to the photographic library showing the work done by France to improve health conditions in overseas territories. - A collection of 18 000 works. - Subscriptions to 313 periodicals specialized in tropical Pathology. - A slide library on tropical pathology. - Health archives ranging back to 1926. - A CD-ROM of the PASCAL data bank, with a selection of references to Tropical Medicine. The administration of the library is computerised. - controlling journals, dissertations and theses. - exchanging documents between libraries. The centre is affiliated since 1986 to the C.C.N. (Catalogue collectif national) which makes an inventory of all journals and publications to be found in all the libraries of the nation in order to facilitate lending. 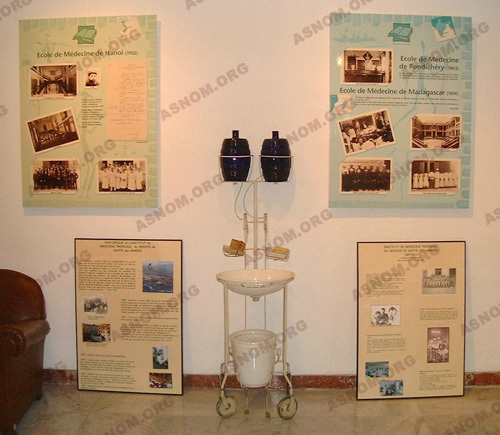 The Centre of Documentation, which was initially created to improve the knowledge of the officer-students of the Pharo's School of Applied Medicine, has rapidly become an instrument of training, of collaboration and the diffusion of scientific information to the Colonial Health Service. Since 1941, it is closely associated with the journal "Médicine Tropicale". It is in contact with physicians practising in the tropics and at the disposition of universities and foreign trainees looking for information (works of reference) concerning the tropics. The various documents constituting the documentation centre and the library have been transferred to different sites during the first semester of 2013. The entire library, works and monographs were transferred to the main library of the Val de Grâce Army Medical Service enhancing it by the addition of an exceptional tropical note. The medical magazines have followed the same orientations and are itemized in a file. The memoirs and the theses have been sent to the Lyon Bron Army Medical school. The photographic library composed of photos on paper or digitized, museum pieces, phonetics library constituted of interviews with high-ranking officers and school heads have been sent to the person responsible for the Val de Grâce Army Health Service Museum. The old archives and medical archives from the colonial era, listed in a digital file and the pre-independence technical reports originating from different territories are to be found in the Toulon historical department of Defense. The laboratories have joined the Alphonse Laveran Army Instruction Hospital in Marseille and the Army Epidemiological Centre has been installed in Marseille at the Sainte Marthe Camp Marseille.